Darn, I got question number three wrong and lost $3,000. You Don't Know Jack is a video game styled like a game show with support for 1, 2, or 3 players. 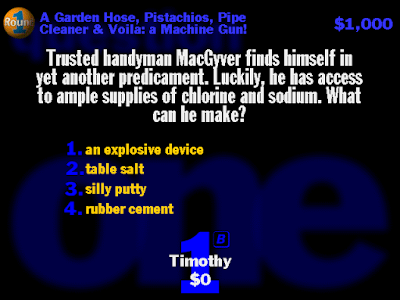 Players buzz in when they think they know the answer and choose the correct answer (in single player mode, the player may simply choose the correct answer). I got the first question right! I'm off to a good start. I played a round of 21 questions from the first game of the series, YDKJ (Vol. 1) XL, today. Each question is worth a different amount of money with harder questions being worth more. Get a question right to earn the money, get a question wrong to lose it. After it was all over, I only made $22,000. out how it was suppose to be played and got the second one right. I liked the presentation of the game. In particular, I really felt like I was on a game show and not simply answering a bunch of trivia. Similar to Cranium, there are various question types and many different questions. 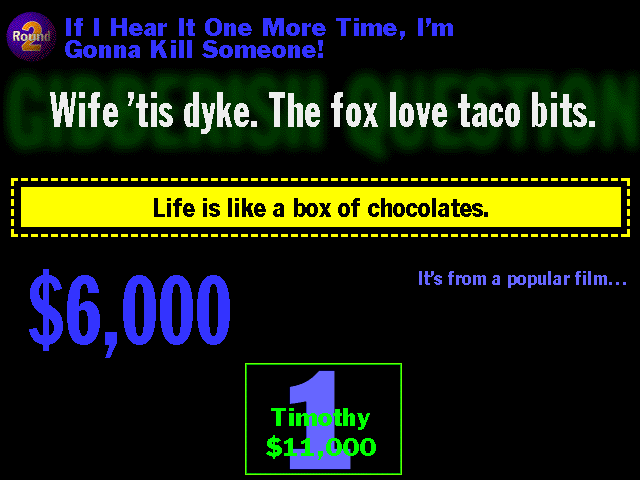 While I'm unsure about the size of the game's question database, it's probably large and if I ever ran out, I would just play one of the eight other YDKJ games in the YDKJ Classic Pack (part of the Humble Flash Bundle: Extra Life). I look forward to playing this game with my friends in the future. Pick a category at the start of each turn. 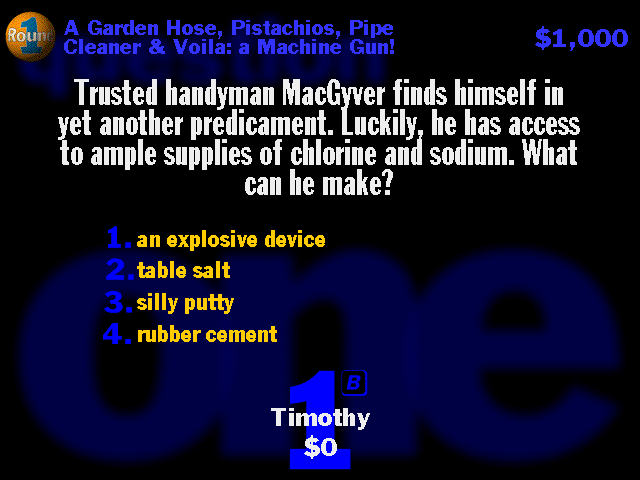 I have very little experience with (playing) trivia games. In fact, I can more or less summarize it here: Encarta MindMaze (video game), Cranium (board game), Dave N Busters Super Trivia (arcade game), and a handful of trivia nights. 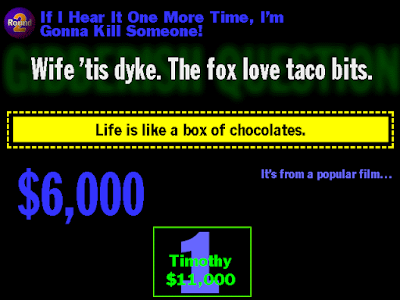 As such, while I enjoyed playing YDKJ and would recommend it to others, there are other many ways to satisfy your trivia desires (including new releases of YDKJ). Today I played another round of 21 questions, but it went by much faster. I suppose the only problem I encountered was forgetting that I had to press a specific key to buzz in. In any case, today I only answered questions which I was sure about (though I still got a couple wrong). 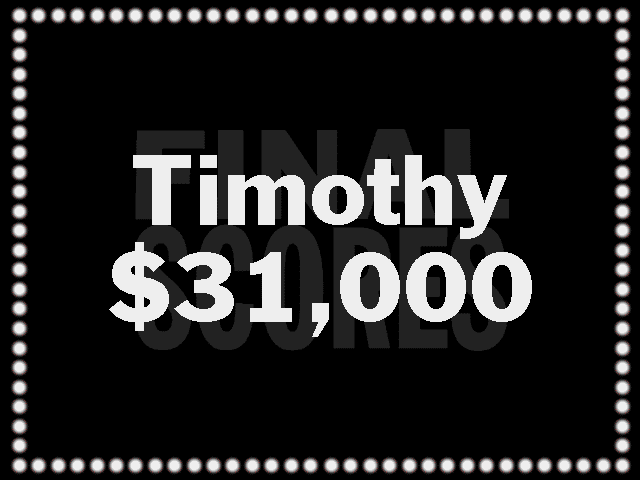 Under this strategy, I finished with $31,000.